I asked my friend if we could grab take away from her local shops at Casey Market town, which seemed to be forever expanding. 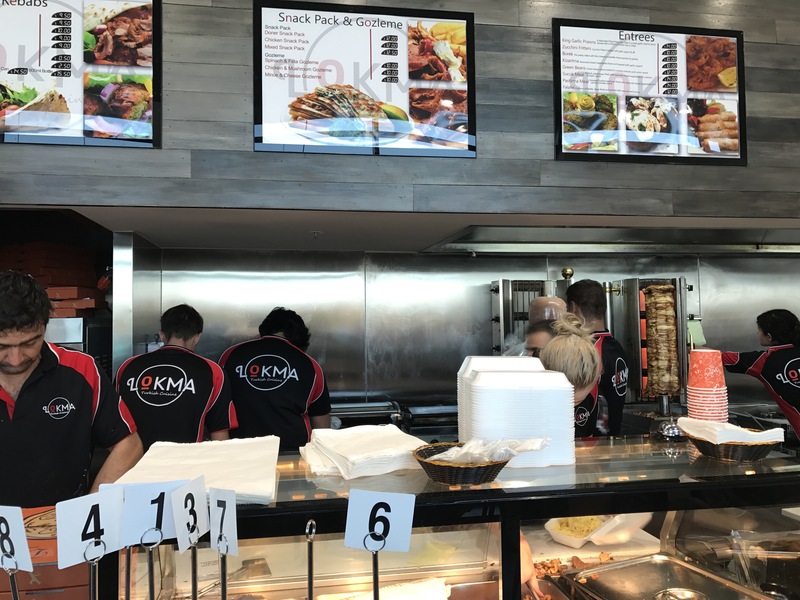 Lokma is one of Casey’s newest eateries and when we arrived Friday afternoon to grab take away, we saw ten staff members zooming around so we were not the only ones with the same idea. I couldn’t fit all staff members in one shot as they kept running around because it was so busy, it was impressive to watch! Banquet (minimum 2 people $22.00 pp) dips, zucchini fritters, borek, pide, chicken skewers, kofte, rice, salad, bread and baklava (not pictured). I was really surprised that we were able to choose any three small dips with our banquet for three people; we chose hummus, beetroot and carrot. Sweet chilli chicken pide marinated chicken with mixed vegetables and sweet chilli sauce ($4.00 extra). We paid a little extra for our pide as it was one of the more expensive ones but we didn’t realise this until we went to pay. I’ve never had a pide with sweet chilli sauce so I thought it was unusual, I think I’ll order a more traditional filling next time. The pide was massive! We weren’t even close to finishing all the food but it was expected as no one I know has ever left hungry from a Turkish banquet. I thought the grilled meats were better at Sultan’s in Gungahlin but I was astounded and impressed with the value for money for the vast variety of food you get, which can be enjoyed in the comfort of your own home (or a friend’s!). It was so busy that night that our order took over 30 minutes to prepare but we just strolled around to check out the other stores. Despite looking like chaos, our order had everything packed and ready to go when our name was called. I would like to go back to try their kebabs and snack packs as they were very generous with their fillings and toppings. We were driving home from Sydney when I realise there was nothing but carrots, eggs and butter in my fridge, so I made plans to meet my friends in Braddon to try out the new dumpling restaurant Yat Bun Tong for dinner. On a Sunday night without a booking at 7pm, we were very lucky to get a table for four without a reservation. The menus are huge (and heavy) because of the diverse range of dishes and the accompanying photos. I had to be careful not to over order and there were a few dietary restrictions within the group. I was torn between ordering the Shanghai pan fried pork bun (10 for $14.80) or the Shanghai steamed bun (10 for $13.80) but because I know the pan fried pork buns can be filling, I went with the steamed dumplings so I could order more dishes instead. I expected them to come out in a particular order but instead they came as they were ready and the gap between waiting times wasn’t that long. It was a struggle to fit everything on the table though as the plates are rather big. Garlic chicken fried rice ($12.80). I wanted a more garlic flavour but it was nice enough as an accompaniment to the other dishes. Fried beef onion dumplings (15 for $12.80). These weren’t fabulous but still rather tasty and I preferred these over the steamed ones. 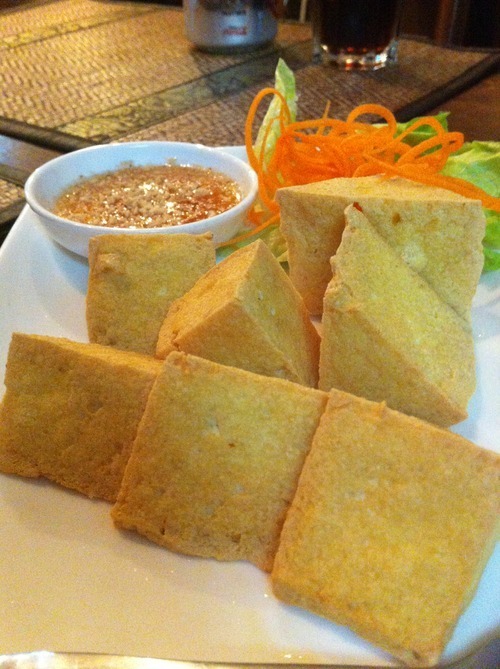 Pan fried chive cakes (2 for $8.80). Not very flavoursome and definitely not worth ordering again. Shanghai steamed bun (10 for $13.80). There is a little soup inside each dumpling which stayed inside as the dumpling wrapper wasn’t too delicate. I didn’t love the taste of the dumpling though. 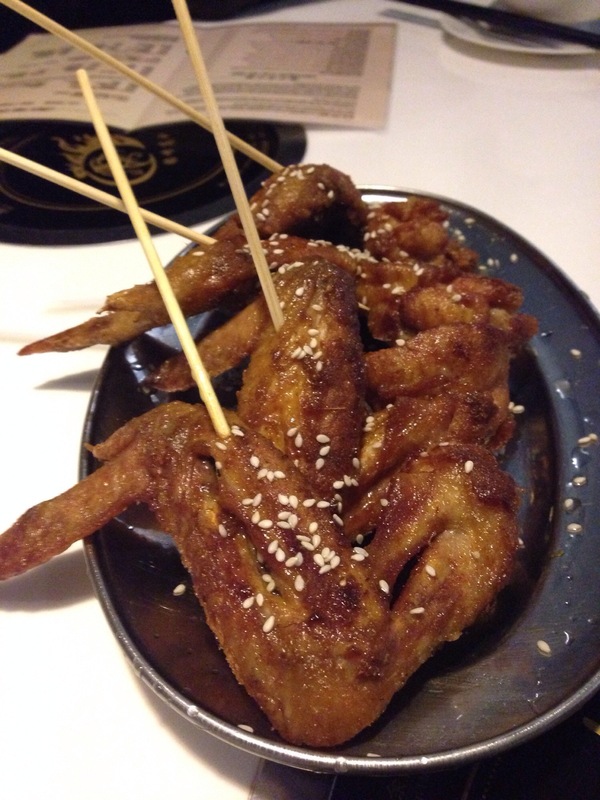 Deep fried soft shell crab with spicy peppery salt ($19.80). I was surprised to see that this was a rather large serve. The batter was a tad too thick but there was plenty of delicious fried garlic, chilli and shallots. Chinese broccoli with garlic ($14.80). 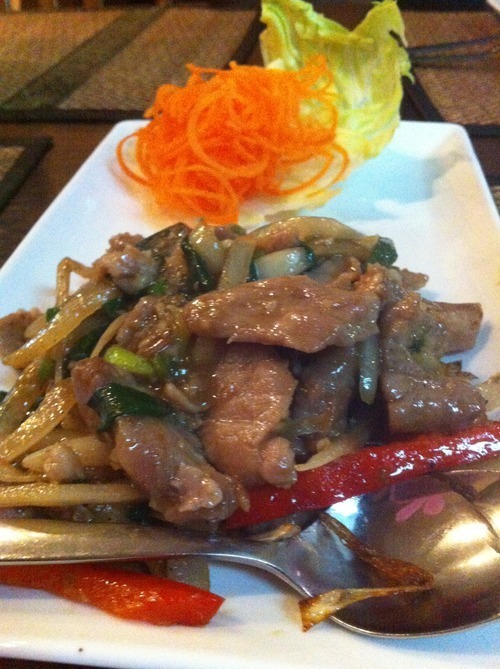 A simple tasty dish to break up the oily and heaviness from the other dishes. Someone told me that Yat Bun Tong have the same owners as Chinese Kitchen Dumpling House in Woden. It’s no Din Tai Fung but it is better than other dumpling places I have tried around town. I would like to come back and try the other dumplings like the Shanghai pan fried pork bun and also try their noodles which I hear is quite nice. I’ve been wanting to go to Petra Palace restaurant since it opened late last year and when I finally organised a dinner there I got sick, but like I said, I was just postponing all my plans so I didn’t miss out. I was able to quickly book a table within the hour of our arrival but I think they are much busier on Saturdays with the added entertainment of belly dancers. There were other people in the restaurant, I just avoided them in my shot; as the night went on the restaurant started to get very busy. I like the combinations of long and round tables. I arrived before all my friends so I was able to have some time to browse the menu before we got carried away with catching up. I was tempted by the banquet but we couldn’t get a general consensus so we all went our separate ways and only shared the starters. Baba ganoush chargrilled eggplant dip with tahini, garlic, yoghurt and fresh lemon juice ($10.00). You could really taste the smokey flavour from the chargrilled eggplant, I don’t usually love baba ganoush but it had a stronger flavour than the hummus so I preferred this dip. 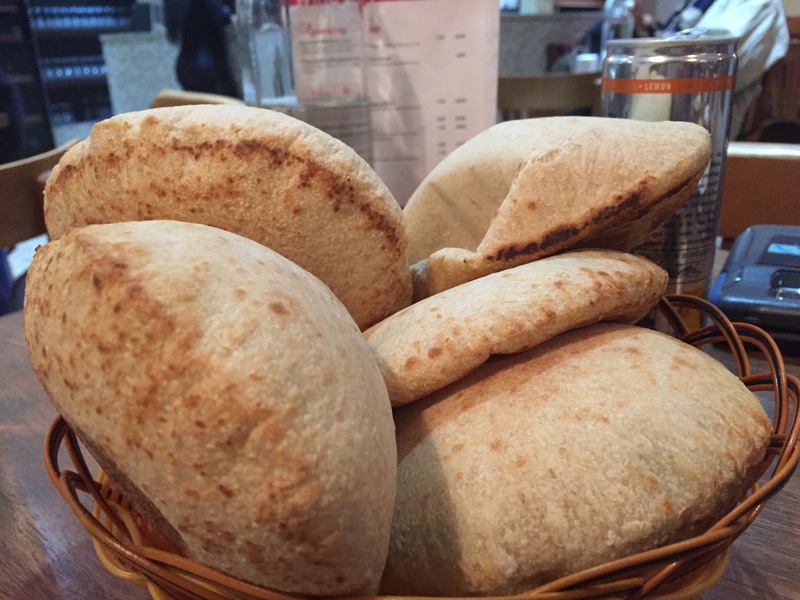 I really enjoyed the hot Lebanese bread that it was served with, it was very hot and crispy, I was very tempted to order more if I didn’t have a rice dish as a main. Piping hot bread for the table. 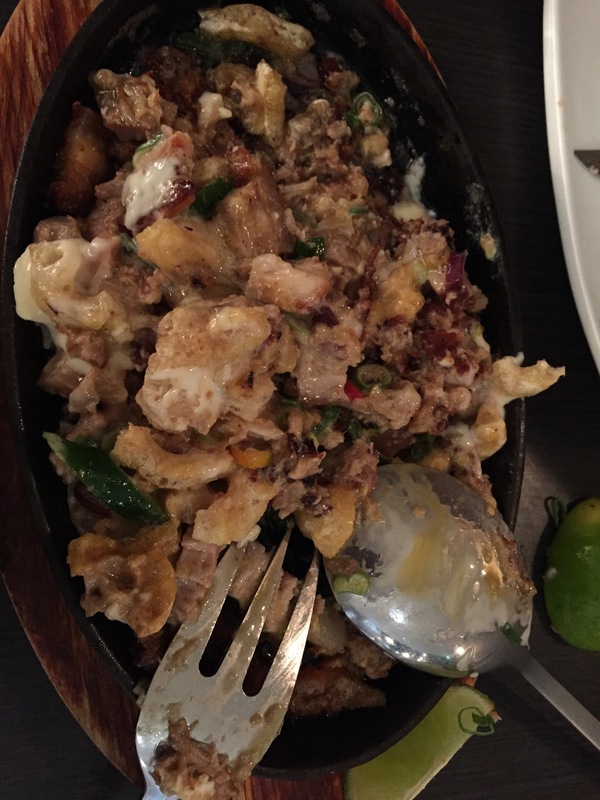 Bandora kafta baked lamb and beef topped with sliced potato and a tomato, garlic and green chilli sauce ($25.00). My friend was worried that the green chilli would be too intense in this dish but I wouldn’t have known it was in the sauce. Although the kafta was blanketed by a rich tomato sauce, you could still taste the delicious lamb and beef and the meat was very succulent. I found the sauce complimented the meaty flavours rather than overpower it which was really nice and the potato was perfectly cooked; I’m surprised that it didn’t overcooked under the sauce and disintegrate. Mixed grill one skewer of each: chargrilled lamb kebab, shishtawook (chicken kebab) and kafta (ground lamb and beef) kebabs served with hot chips and grilled vegetables ($25.00). I was really tempted by this menu choice but I ended up choosing something different. This is a good way to try a bit of all the skewers. I really like the garlic dip that it came with, it was really garlicky without the strong aftertaste. I thought the chicken looked a bit dry but it was still a little moist, although it was my least favourite of the three skewers. I found the lamb a little tough and the kafta was by far my favourite. If I had kafta skewers with rice, garlic dip and yoghurt, I think it would be the perfect meal. I love chips as much as the next girl but I think it would have been nicer to serve all this meat with some rice. Shishtawook diced chicken kebabs marinated and chargrilled, served with a garlic dip on a bed of couscous (3 skewers $25.00). With no actual ‘sauce’ and the chicken being on the dry side served alongside dry couscous, it made for a lot of chewing and water sculling. Be alert not alarmed, that is a roasted onion with its skin on at the top of the plate, not an overly burnt piece of chicken. Chicken fatteh delicious casserole of marinated chicken, crispy Lebanese bread, spiced rice, garlic, mint and yoghurt topped with pine nuts ($25.00). When I was telling the waitress I was trying to decide between the mixed grill and the chicken casserole, she went to explain that it wasn’t exactly a chicken casserole but rather a layered dish where the bread was on the bottom, layered with marinated chicken which was then topped with yoghurt and mint and nuts; I was intrigued and chose the fatteh as my main dish. 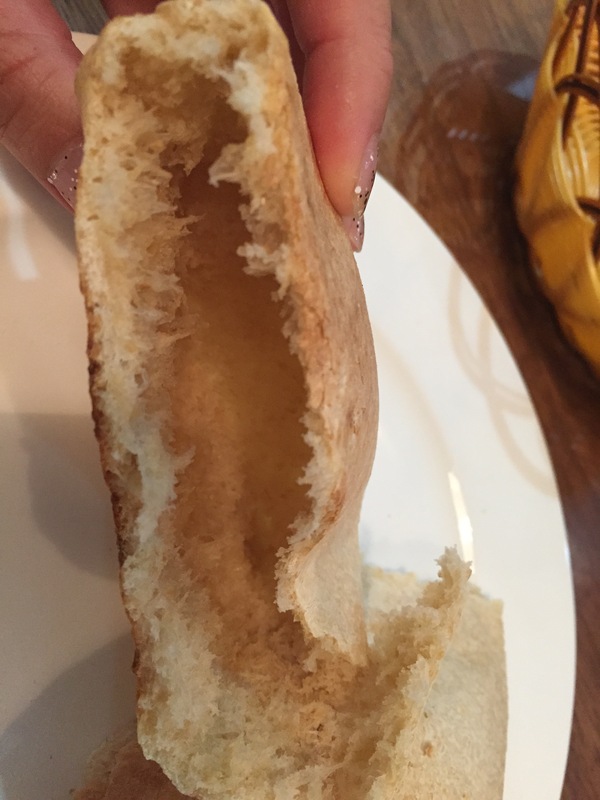 The bread became all soggy and almost felt like a pasta sheet at the bottom of the dish. I could easily grab a spoonful and have a bit of every layer in every mouthful. The mint in the yoghurt was really refreshing and there was something in the rice that made it feel like Christmas in my mouth. The pine nuts stayed crunchy which added to the texture and gave it a really nice nutty aftertaste. 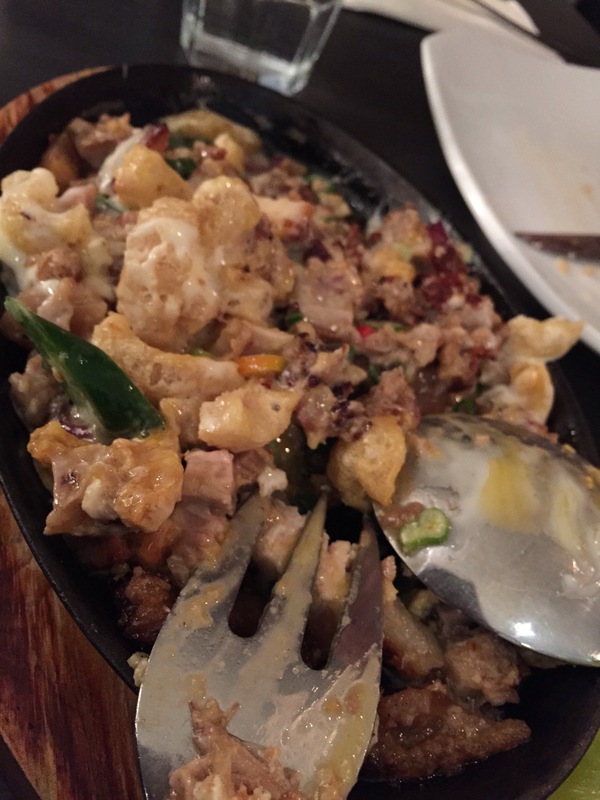 I really enjoyed this dish and it is something different that I wouldn’t usually be able to find on a menu. Despite the restaurant getting more and more busy throughout the night, we were never forgotten; our dishes came in a timely manner, the water was constantly replenished and they were happy to answer any of our questions regarding the menu. There were new staff members starting that night so we had to wait for experienced staff members to become available to use our Entertainment book voucher and get the bill. I would definitely come here again, eat lots of bread, kafta and rice, although there are plenty of other things I want to try on their menu too. Entertainment book: Yes! Don’t forget to use it. 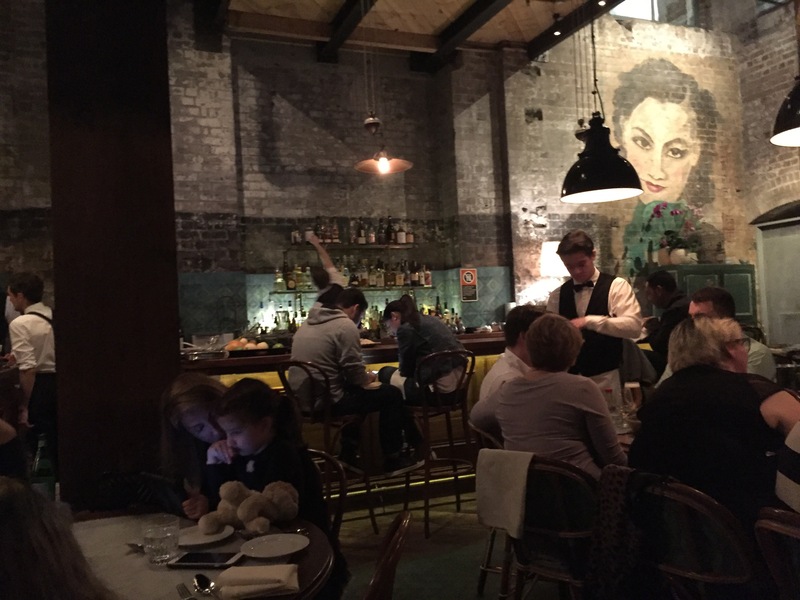 Canberra has had such restaurant boom in the last few years, I cannot keep up but at least I’ve heard of most of the places even if I haven’t been yet. 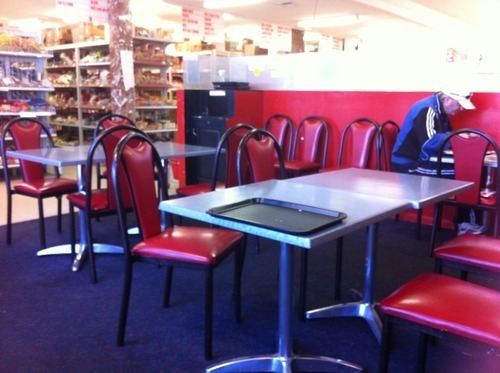 So when a work colleague asked me if I had been to a Pakistani restaurant in Phillip, I gave him a look of deep concentration as I scanned through my mental restaurant library and came up blank. What was he talking about, how was there a restaurant south side out of all places that I haven’t heard about!? 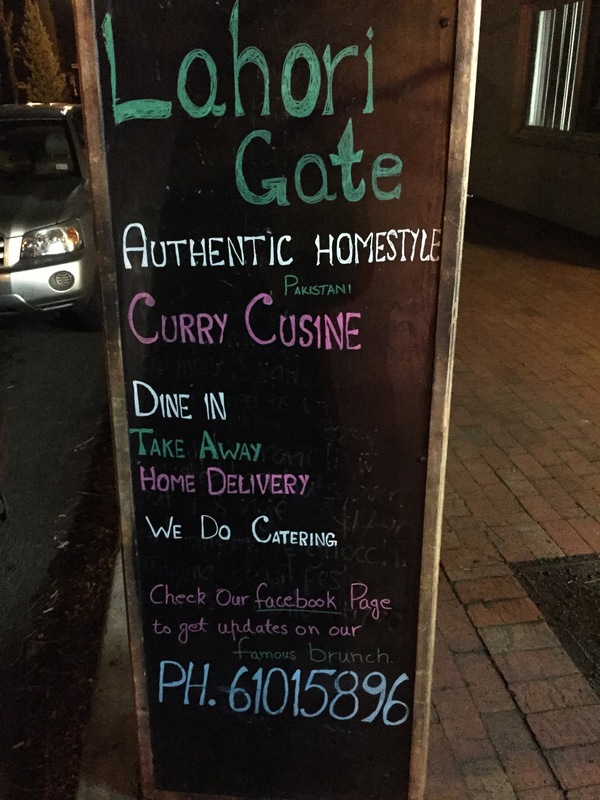 Lahori Gate has been open for the past 8 months and are looking to expand all without registering on the foodie radar, but it has obviously made waves in the Pakistani community. Even the ambassador went there to eat and was so impressed that Lahori Gate now caters for some embassy events. We were all curious about this restaurant so a group of us from work went later that week. When we were all seated the waiter/owner clarified with us that they are a Pakistani restaurant not an Indian restaurant, all the food is home style cooking, his wife and sister-in-law run the kitchen and do not to expect cream and sweeteners to be added to the curries. ‘Perfect’ I said smiling, ‘that’s exactly what we’re here for’. Rice ($4.00 serve we had two serves between the 8 of us). 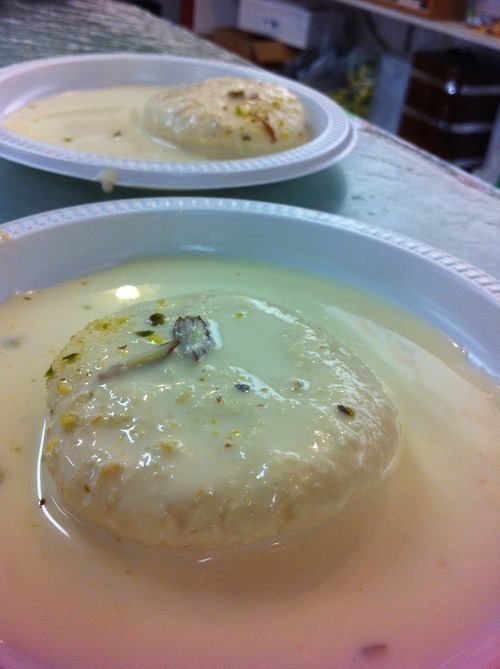 Rice pudding (Kheer $8.00). I’m a sucker for rice pudding so while everyone choosing ras malai, I was shouting out for rice pudding, in the end we got two of everything so there was enough for everyone to sample a bit of everything. This was subtle sweet but was mixed with nice spices. Ras malai ($8.00). I have eaten my fair share of ras malai (although I still wouldn’t be an expert) and this would have been one of the nicer ones I’ve had. My work colleague was not as impressed and said that they can make it better at home, unfortunately not all of us are that lucky. Carrot pudding ($8.00). This was not on the menu but the waiter/husband/brother-in-law was saying that he made this dish himself and if we would like to try some, so we ordered this as well. It looked very unusual but it tasted very balanced between the sweetness, spices and the natural sweetness of the carrots. 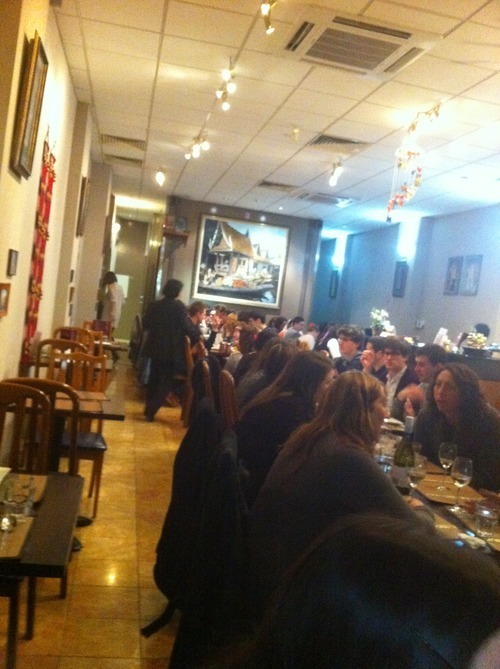 The dining area is very small and might not fit more than 40-50 people comfortably and although patrons were sporadic during our meal I would still suggest to book to avoid disappointment. 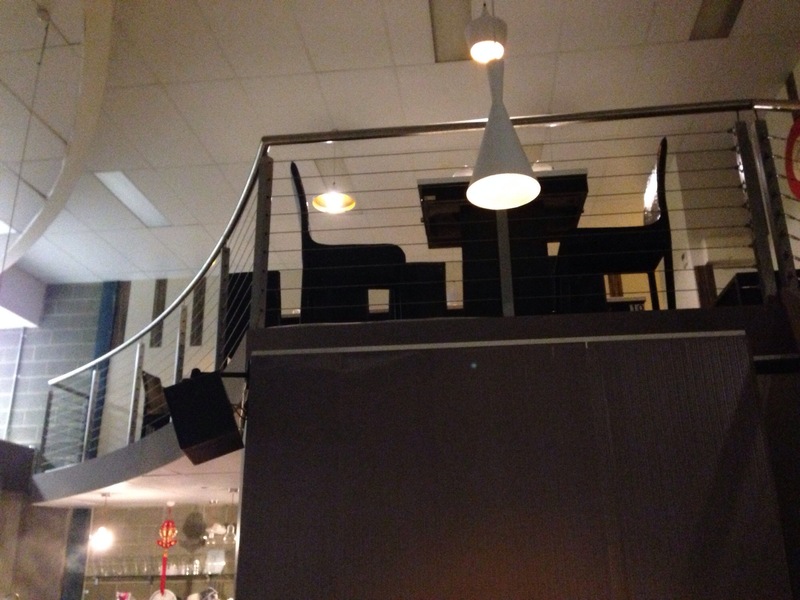 I quickly took a photo before the restaurant became fairly busy. 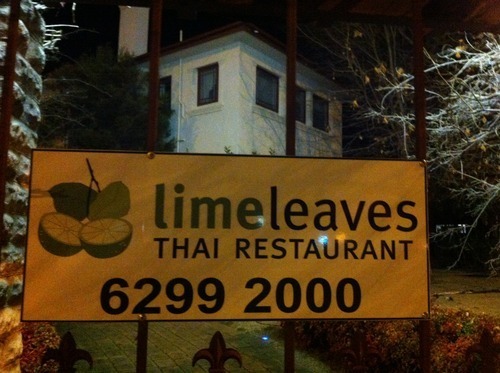 I really enjoyed the food here, it offers a menu unlike any other I’ve seen in Canberra. It is nestled away in the apartment blocks near Woden CIT and I wouldn’t have known that this place existed if my work colleague hadn’t seen a flyer in a grocery store. Apparently they have ‘brunch’ buffet once a month on a Sunday, it is not on a set day every month so check out their Facebook page for upcoming events and brunch dates. For $18.50(?) 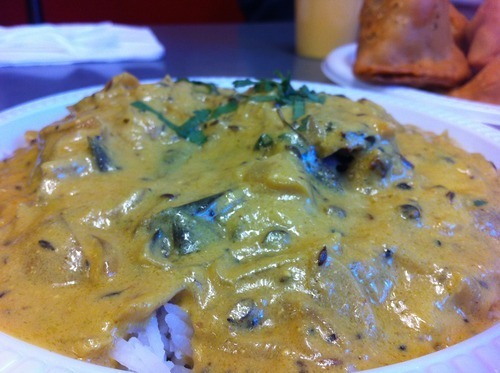 you have a choice between 8 varieties of curries and it is very popular that the line is always out the door. I never knew that there was a whole other world behind the Boardwalk in Belconnen facing towards the lake, luckily I had read the review from In the Taratory about this place, otherwise I would have thought my friends were taking me to a quiet dark place to ditch my body by the lake. The signs for the restaurants were sketchy and hand written but I assure you that there is a restaurant behind that fogged up glass. This restaurant could easily be mistaken for a European bath house as all the steam condenses on the cold glass doors. Very dodgy looking signage around the place but they all point you to the right direction of the restaurant that is tucked away at the end of the Boardwalk. 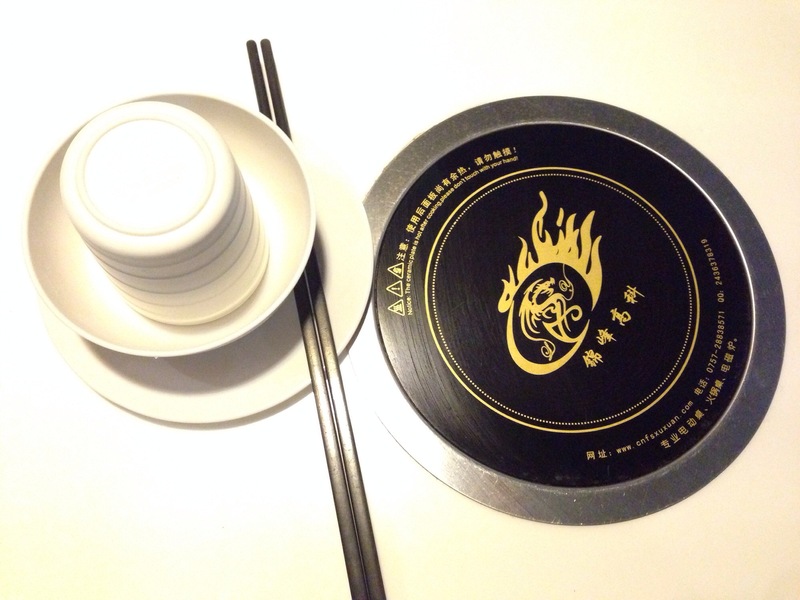 I was really excited about eating here and couldn’t help but eat from the three categories that this restaurant offers: BBQ, hot pot and clay pot rice. I ordered chicken skewers immediately upon arriving as we wait for the birthday girl so I wasn’t tempted to start eating my friends. It should be no surprise that I ordered this. The chicken wings were met with lots of enthusiasm between being hungry at such a late time and feeling the cool draft blowing from the doors, although the waitress didn’t quite understand me as I wanted 4 serves but she only gave us 4 skewers (2 per serve for $5). 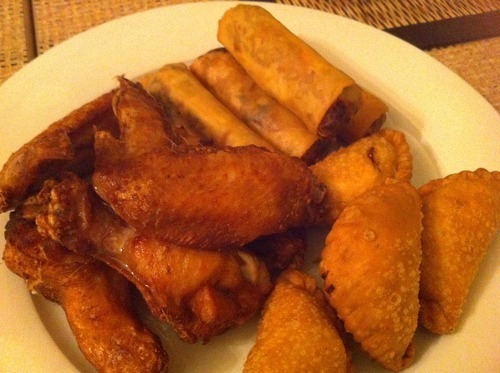 The chicken wings had slits cut into them to ensure thorough cooking. They were served hot and crispy (maybe marinated with curry powder? 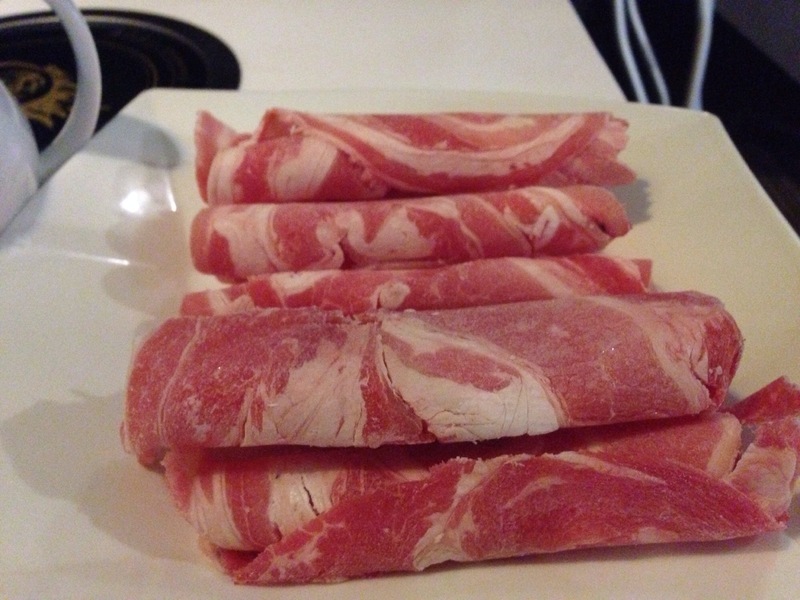 ), I didn’t leave any meat to waste. It was very tasty and we ordered more when the birthday girl arrived. 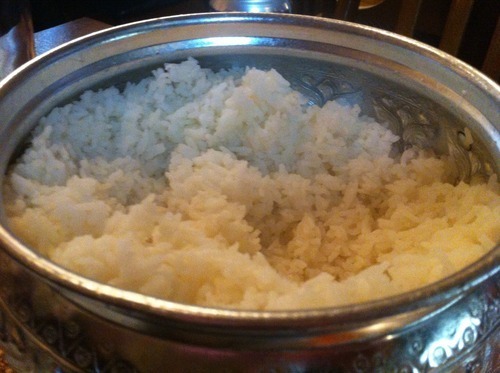 Cantonese Clay Pot Rice~ “The making of clay pot rice is quite simple. Put the rice into the clay pot after washing it. Add appropriate (amount) of water and close the lid; cook the rice until it is 70% done; add in all the ingredients and simmer the clay pot with a slow fire”. 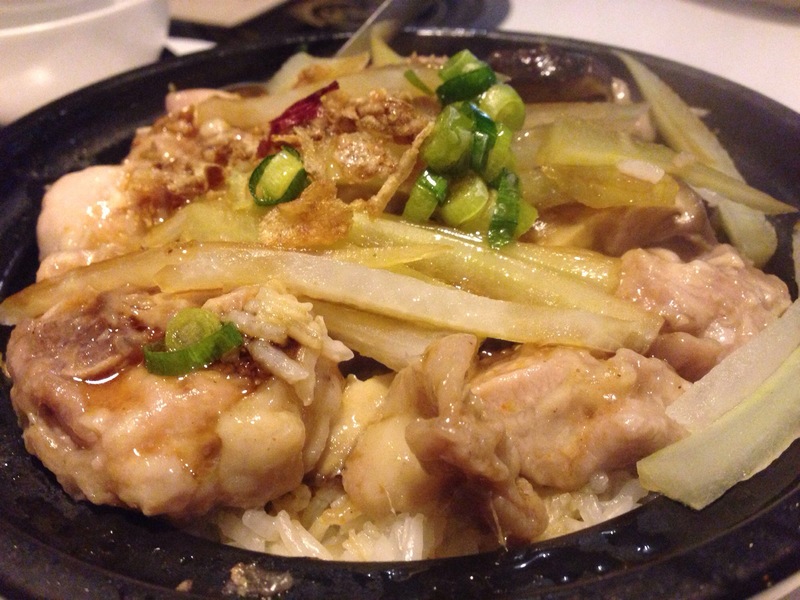 I love clay pot rice, it was one of my ‘must eats’ before I left Hong Kong during my last trip. I was tempted to order three of the same thing but I thought variety is the spice of life so I chose another two flavours that generally appeal to everyone’s taste buds. I enjoyed all of them overall, this restaurant is the best (and only?) 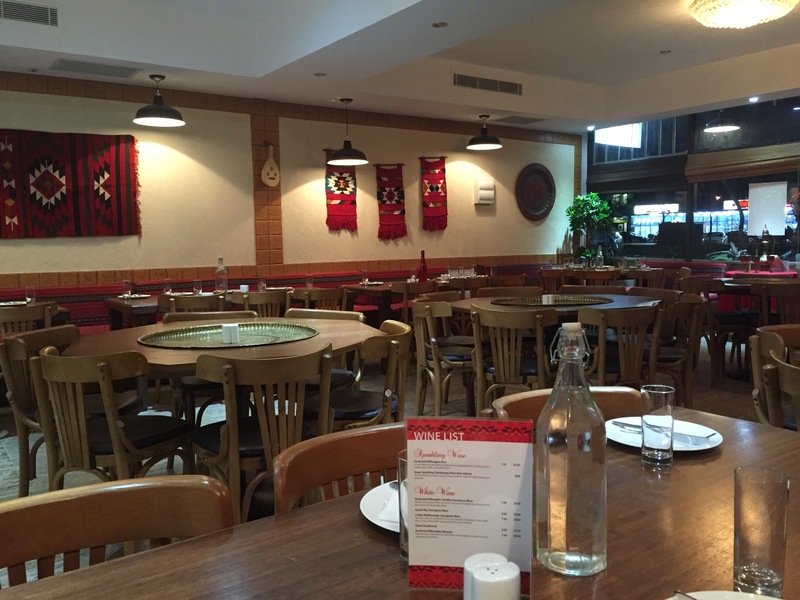 place to get a clay pot rice around in Canberra. They take around 20-30 minutes to cook which we were happy to wait for. 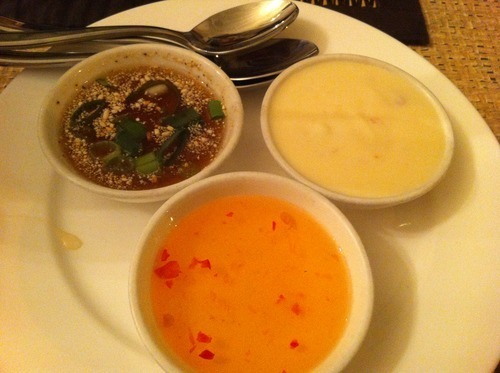 This is what my friend’s have dubbed ‘Asian fondue’. 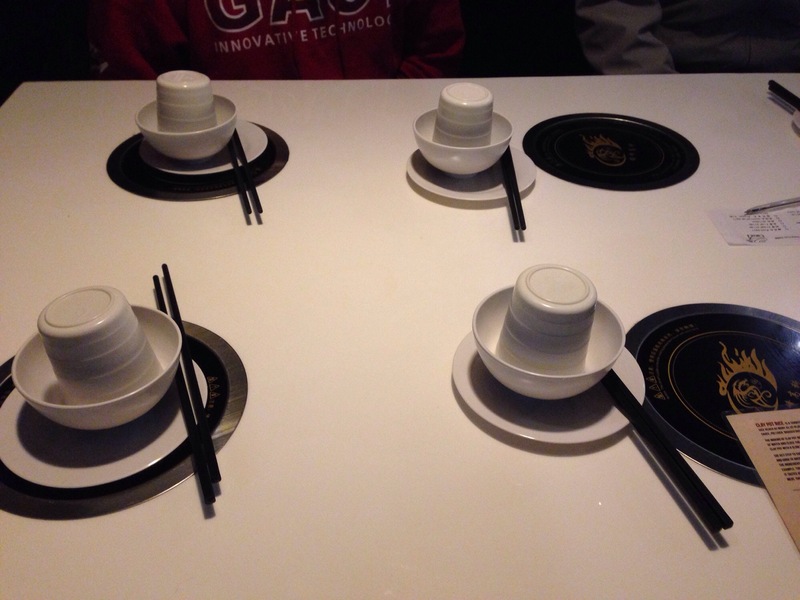 A little easier not to lose your food with individual hot pots and is an easy quirky way to have dinner with friends. Firstly you choose a soup base, then a variety of thinly sliced meat, noodles, protein balls and seafood with an ‘all you can eat’ vegetable table and cook it all in the pot. When the meat is done it will change colour, the protein balls are done when they have expanded and floated to the top and the vegetables and noodles can be cooked to your liking. 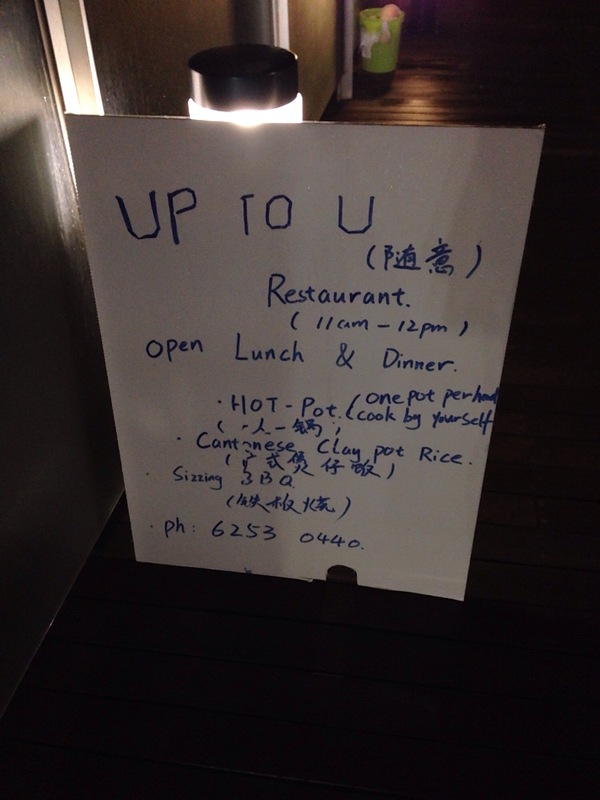 There is a lot of control of how your meal is done and that is probably why they have named the restaurant ‘Up 2 U’. The lunchtime specials menu stipulates ‘please don’t waste food. Extra change will be applied!’. Individual pots also mean that people don’t take all the food I put in which is what usually happens when I’m at home with my family. When the birthday girl arrived she happily said that she would have the steam boat with me while the other guys were just happy to gorge on the clay pots. We both order pork bones as our soup broth and choose a combination of meat, noodles and seafood. They informed us that they were packing away the ‘all you can eat’ vegetables that is on offer for the steam boat but will bring us a selection of greens and vegetables on a plate. I thought it was odd considering they weren’t theoretically due to close for hours to come but we agreed. 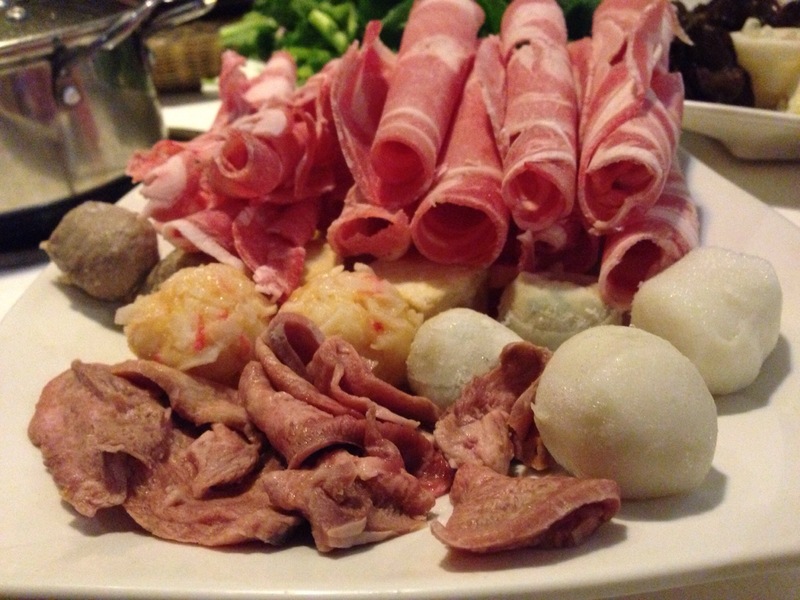 Hot pot for one $25.00 pp or $30.00 pp with free soft drink refills but there is a lunch time special between 11am – 2pm for $15.00 pp. 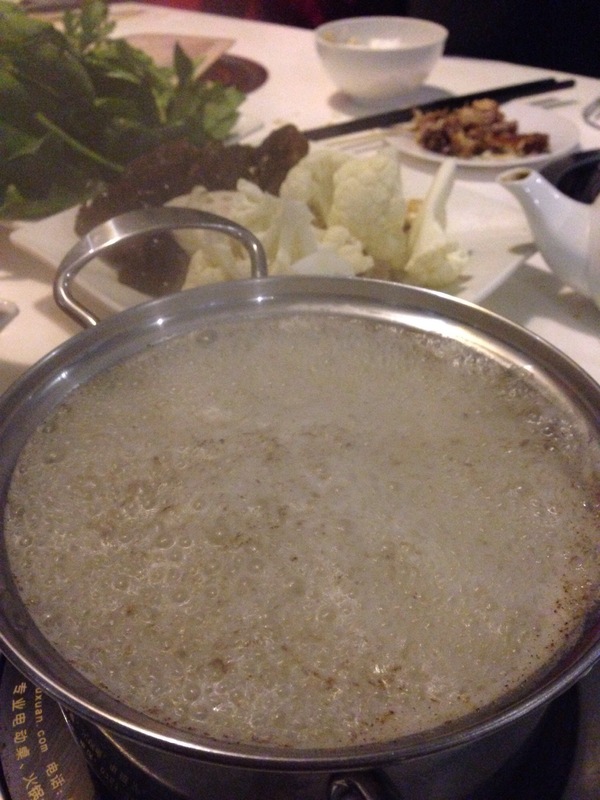 The hot pot is bubbling away, it is time to start filling it up! There was something wrong with the burner I was sitting at, it only had one setting ‘full ball’ so usually when a hotpot is bubbling away and on the verge of over flowing, you would just turn down the heat but I had to eat as fast as I could or add more things to the pot. Intermittently our pots were refilled with more broth and a the end the soup becomes thicker and full of flavour from all the food you have cooked and I couldn’t help but drink it. It left me feeling very full, warm and content. 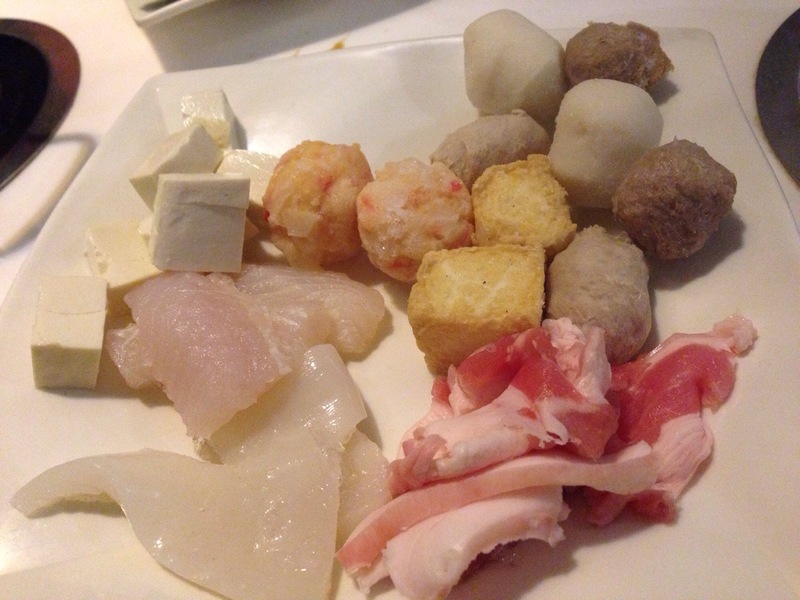 A combination of thinly sliced beef, beef balls, fish balls, lobster balls, ox tongue (not for me) and pork balls. We ordered more food, this time with pork, squid and fish. I found the pork meat too fatty so I left it out. The meat is frozen but don’t worry, it quickly defrosts in the hot cauldron. 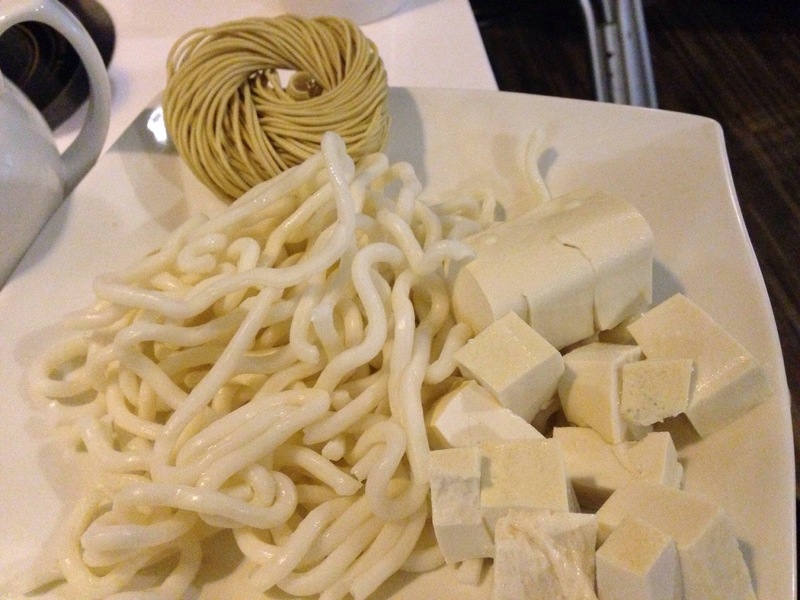 A combination of noodles and tofu. 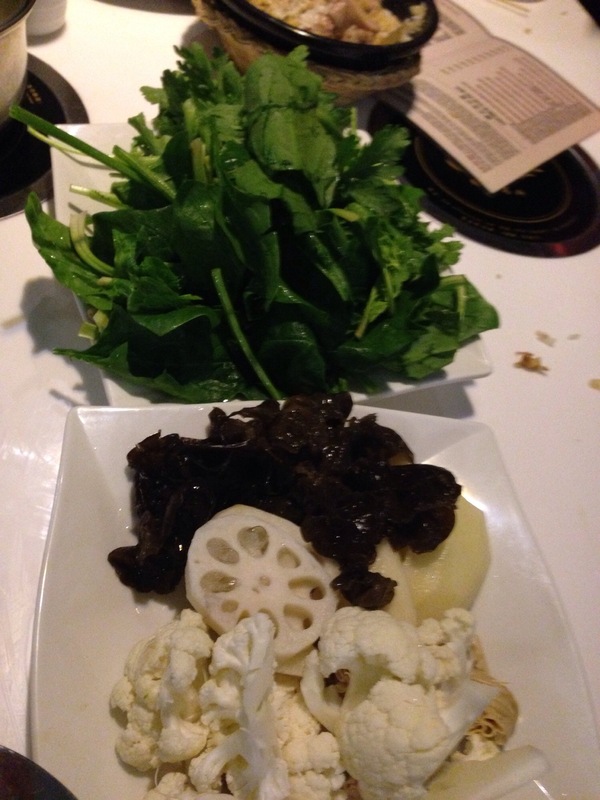 A random mix of greens and vegetables, I think it would have been better if we could have chosen our own. Maybe next time we’ll come earlier. 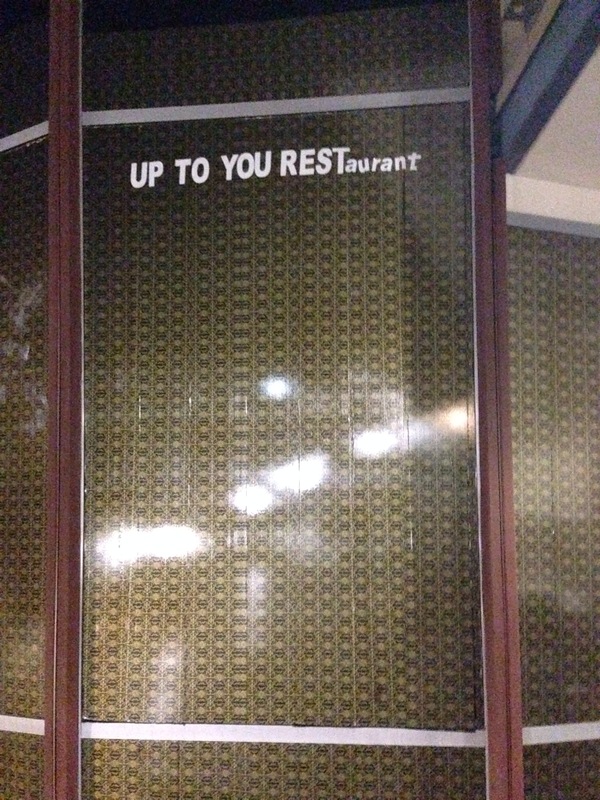 The restaurant is spacious with seating extended to upstairs but there are drafts coming through the doors which make it very cold at night and the glass is constantly fogged up. 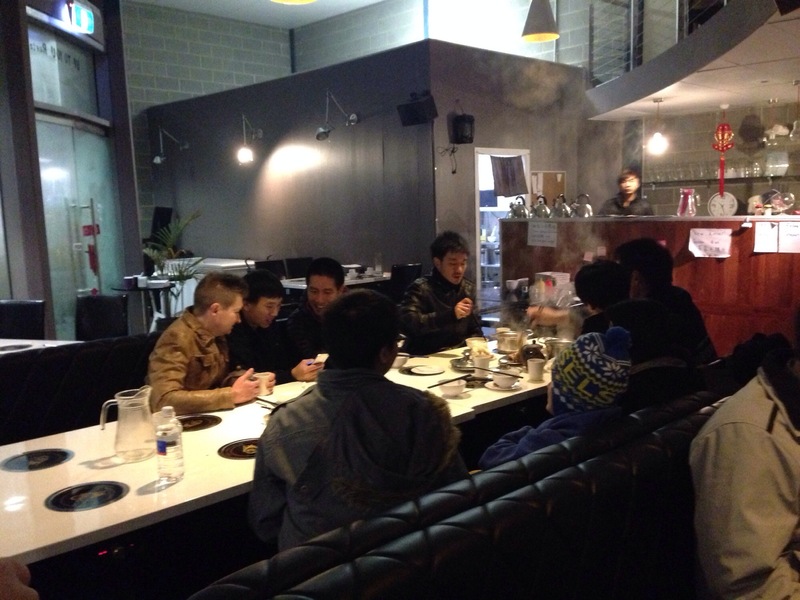 I could see how you could lose hours giggling and chatting over a hot pot with friends with a unique dining experience. 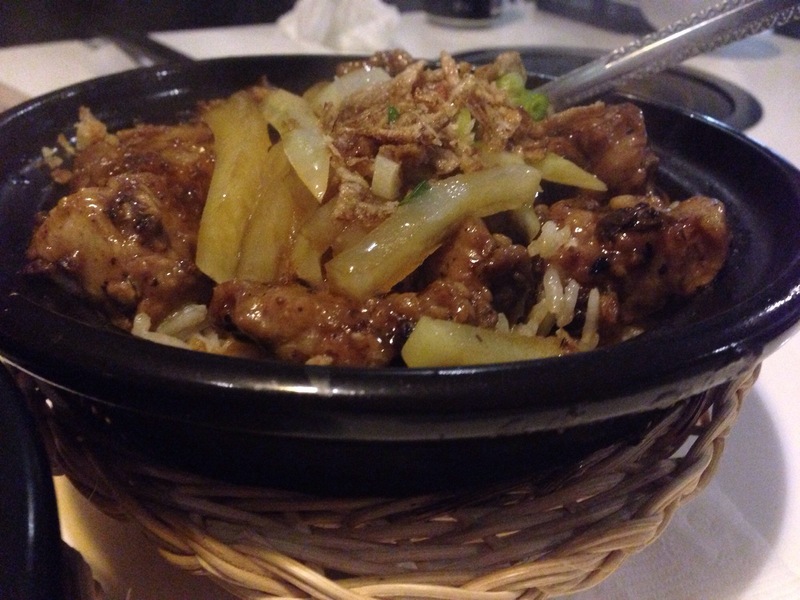 I would definitely come back soon as I have developed a craving for the clay pot rice as I write this post. 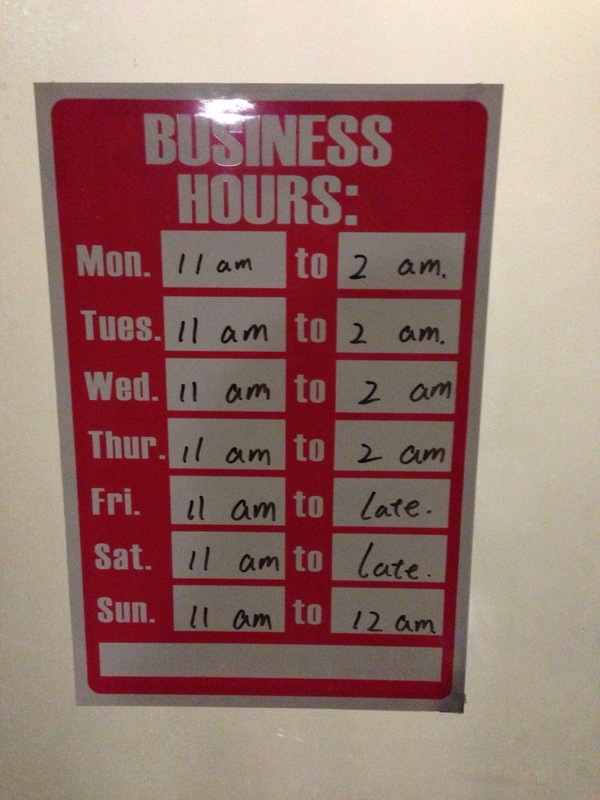 I love their opening hours. Very handy for those who want something different and with convenient opening hours. We left just before midnight and they had packed up all the vegetables just before we started our hot pots so I don’t know if they closed up for the night after we had left. The staff said that we should feel free to ring ahead for the clay pot rice next time to reduce waiting periods, something I will heavily consider doing. 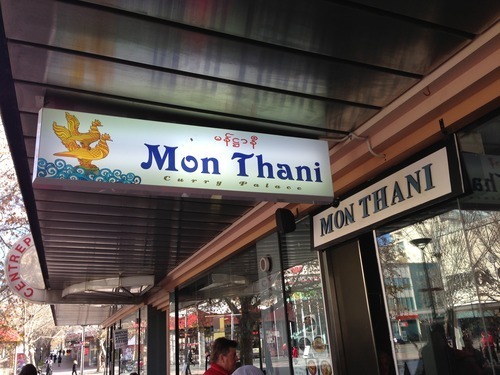 After only just getting back into the country, my friend took me to a new (well new to me) curry place in the city, Mon Thani. 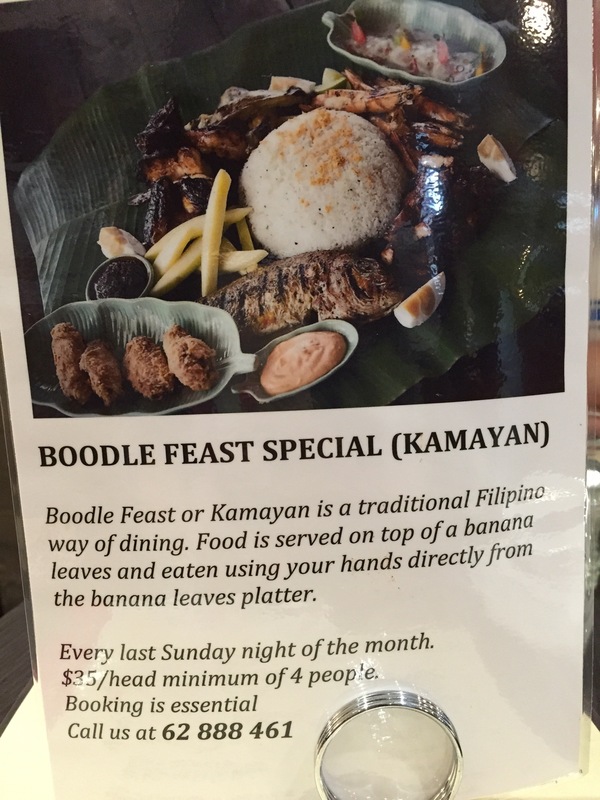 I’ve only been gone for just two weeks but new places are always popping up in Canberra. It looks like the same people that run ‘The Burmese Curry place‘ near the city bus interchange but I’m not sure. The ordering system is easy- you go in, hope that there are seats available otherwise you get your meal to take away. There are 9 dishes to choose from and you can choose two with some rice for $8.00, but it looked like if you eat in you slightly get a little bit more of everything. 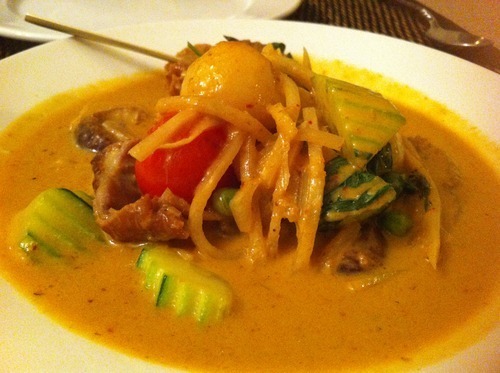 My friend and I both chose the beef and potato curry but it seems like the #9 prawn stir fry was the store favourite. 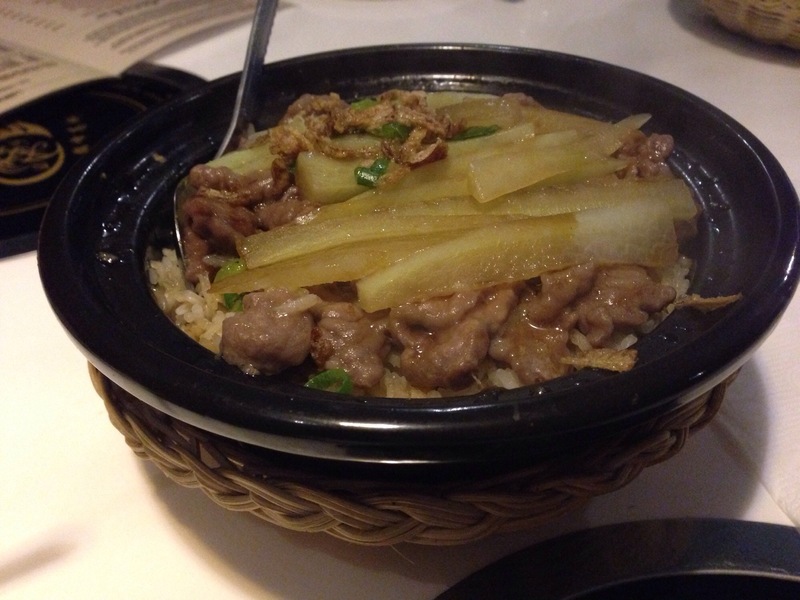 The beef was very tough and chewy, not at all like I expected but there was a good ratio of beef to potato. I chose the pork mince stir fry for my second dish as I really like snake beans, it was okay, overall not very flavoursome. My friend who is a bit more adventurous than me chose the egg curry which I thought wouldn’t sell much but she said that it was rather quite nice. Even though I work near the city, I found driving across Northbourne and parking in the area too labourious for mediocre curries. I don’t know if I would come here again. 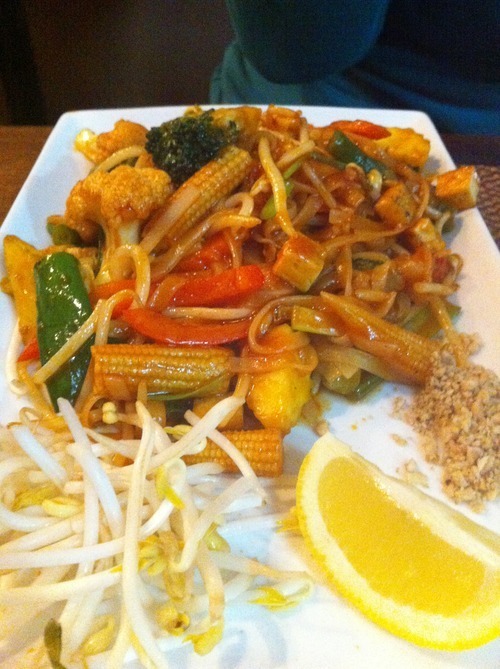 Where did all the tasty cheap Thai places go? Lucky for me, I found one that still exists. 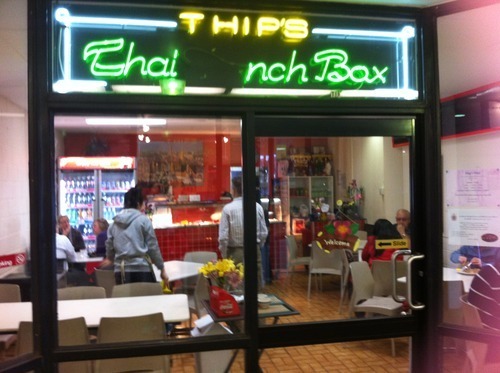 Thip’s Thai Lunch box might not look like much and has limited parking (unless you park at Belconnen Westfield Mall at least that’s two hours of free parking) and it’s in this weird place called the Belconnen Churches centre but it is a hidden gem where many people go to grab a cheap delicious meal. If you’re getting take away then you can be in and out pretty fast despite the long line during the lunch rush, as there are already made selection of dishes to choose from. 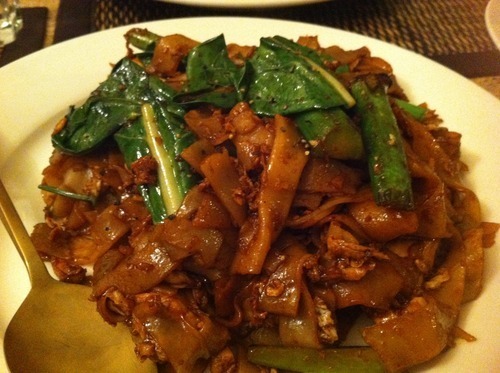 Pad See Yew– served hot and delicious, the best noodles I’ve had in a long time! 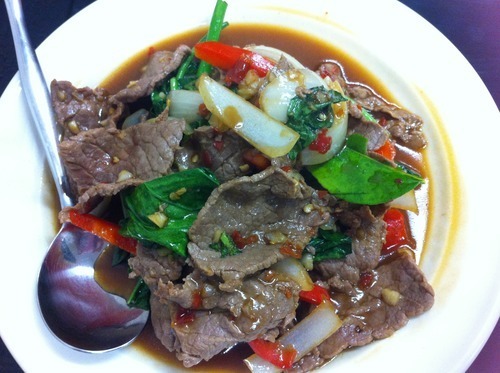 Beef with Thai basil with chilli (medium) ($14.50) I could only just eat this (with lots of rice of course), not only it didn’t have heat but you could taste the chilli which was very good with the basil and beef. There isn’t any glowing service, it’s more of an in and out rushed experience, but the food comes out pretty fast and hot with great flavour to everything. I can’t wait to come back and try more dishes. My friend and I have tried to get to Lime leaves before but we got lost and ended up at Punjabi Hut (still serendipitous), I didn’t realise it would be on the corner in what almost looks like a house from the outside. This time I was determined to go after a few bad Thai restaurant experiences within Canberra, everyone assured me I would like it here. Pik Gai Thoddeep fried marinated chicken wings ($7.50) Not particularly great on its own, much better with the creamy white sauce. Accompanying sauces– they didn’t really explain what the sauces were or what it went with so I just dipped everything in one of them once and stuck with the nicest one. 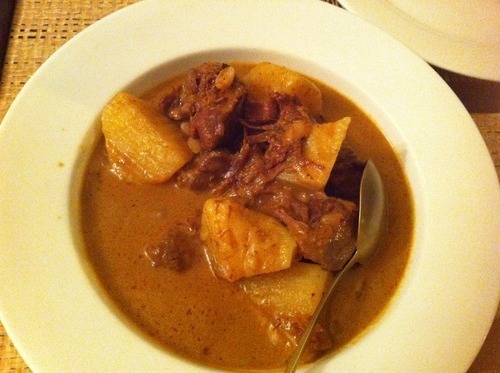 Massaman curry tender beef with potatoes and roasted peanut simmered in delicious curry sauce ($16.50) Not sweet like some other restaurants I have been to and it has really tender beef, I really enjoyed this curry. Gaeng Ped YangRed curry duck with lychees and cherry tomatoes, garnished with lime leaves and capsicum ($21.00) This was bordering on the ‘too hot’ side for me and boy did I have to eat a lot of rice to compensate (although my chilli tolerance is poor and nothing to go by). The duck meat and skin was really juicy and even though it absorbed all the curry flavour, you could still taste the duck. 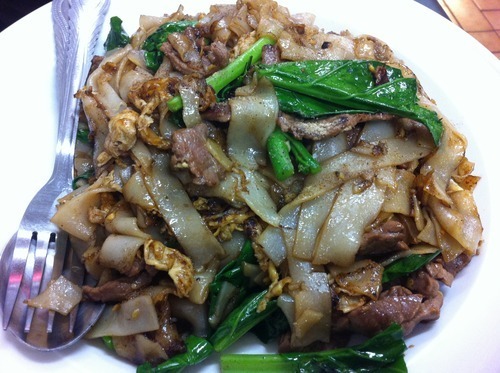 Pad Cee lew stir fried fresh rice noodle in dark soy sauce with Chinese broccoli and egg and chicken ($15.50) Really nice noodles served really hot (temperature wise) just the way I like it. 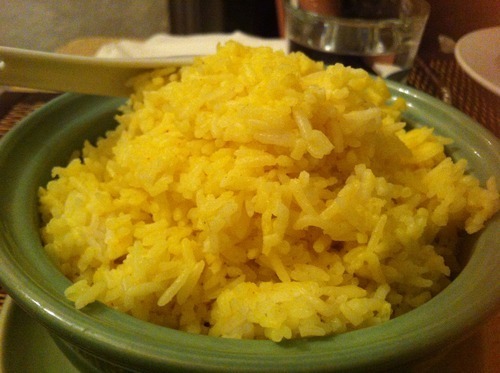 Saffron rice steamed rice mixed with coconut milk and saffron ($3.50 per serve) I have never had any rice like this, a lovely mix of coconut milk and saffron. I didn’t find the service slow, I was having a great chat with my friends that I didn’t notice it was hard to flag someone down until we ran out of rice. 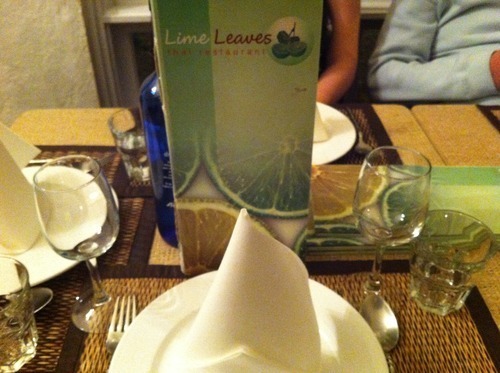 This is a family run business and Lime Leaves has also expanded to open another restaurant (same name) in Kaleen. 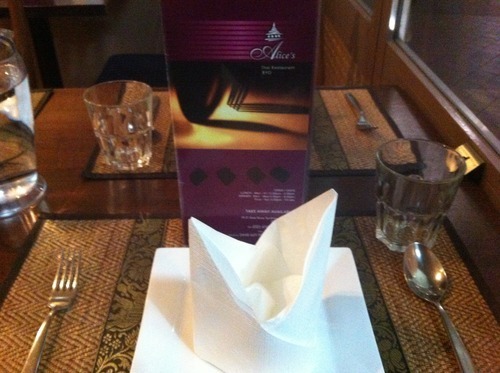 I am keen to come again as this is the best Thai I’ve had in a long time. 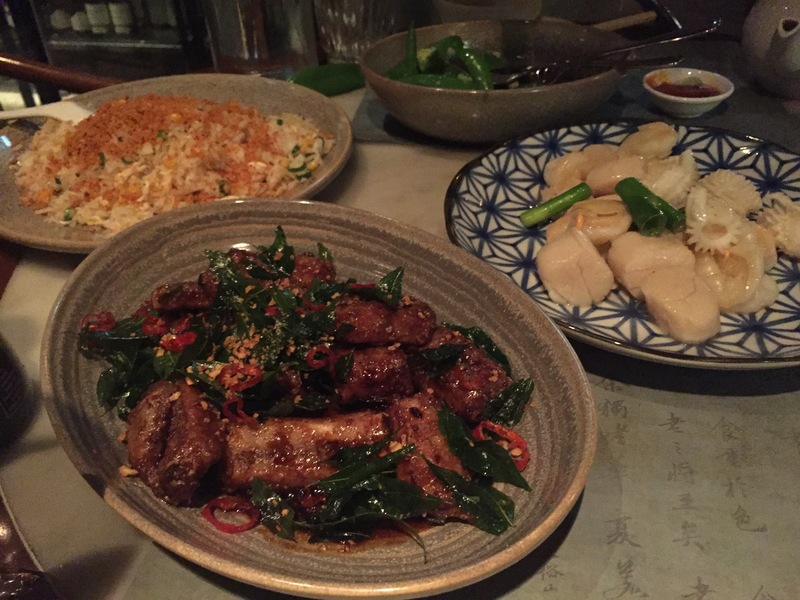 With a busy dinner service and raving reviews from other patrons, I was very excited to try Alice’s Thai restaurant in the city. I was having dinner with one of my good friends who is a vegan and Asian restaurants are usually more accommodating. Tao Hu Tord deep fried tofu served with peanuts in a sweet chilli sauce ($6.90) The tofu would have been nicer with some garlic, chilli and shallots. The outside was nice and crispy though. Pad Kratiem Prik Thai beef with garlic, pepper and onion ($16.90) Not the nicest stir fried beef but the sauce was lovely. 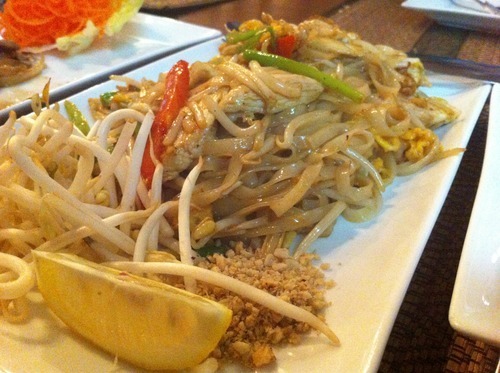 Pad Thai Thai style noodle with beansprouts and peanuts. One of the better noodles that I’ve had and it wasn’t overly sweet or cooked with tomato sauce. Stir fried vegetables with some tomato based sauce. Making vegan food doesn’t limit what you can make if you’re a good cook. We didn’t really enjoy this dish, it was almost like a tomato-ey sweet and sour sauce with mixed vegetables. 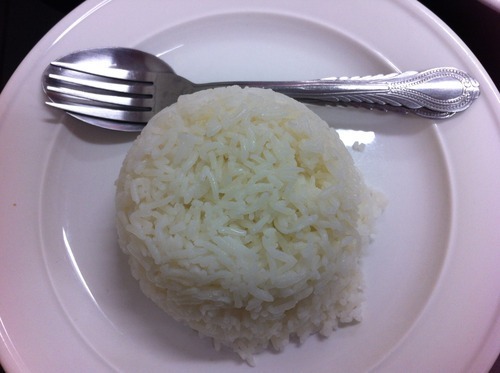 Coconut rice – subtle coconut taste. The last few Thai restaurants I’ve been to have started serving a lot smaller portions while charging a lot more. Most of these dishes only filled half the plate with garnishes taking up the other half. 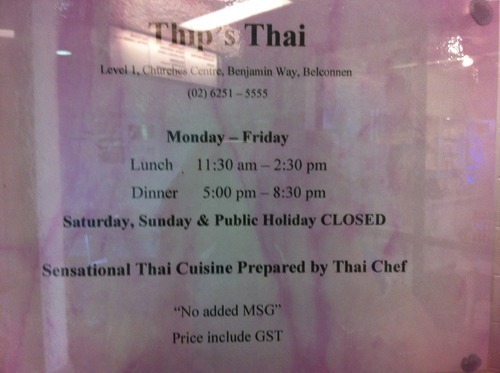 I always thought Indian was the more expensive of Asian cuisine but Thai might be creeping up. The service was very friendly and some dishes were better than others, I’d like to come back and try more traditional Thai dishes. They also have some great lunch specials too if you work close by. I know Indians can make a damn good curry and I know that they definitely can dance but who knew they make really good desserts too! 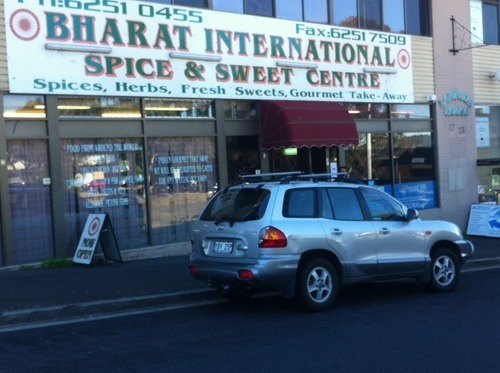 My friend introduced me to Bharat International spice and sweet centre a few years ago and now when I go in the manager recognises my face. 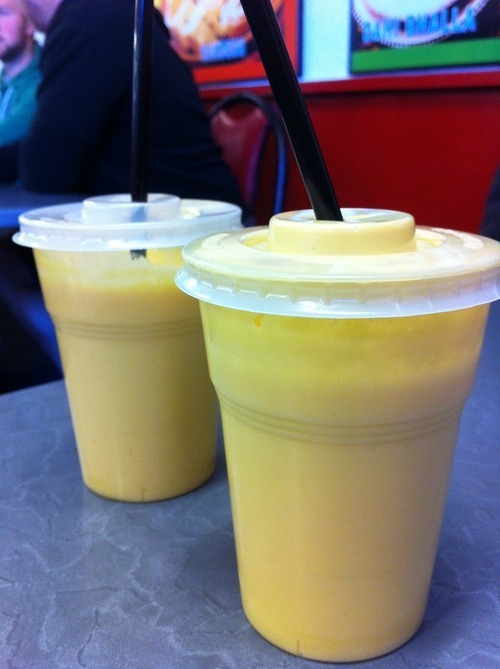 Mango lassi ($3.00) One of the better tasting lassis that I have had and it isn’t too runny. I always get one just in case my mouth can’t hack the curry that I’ve just ordered. It’s hard to buy lassi when I have just started making a lot of my own (it is so easy! ), I’ll have to share the recipe with you guys soon. 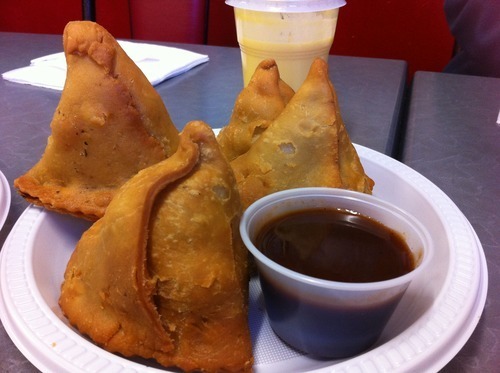 Samosas ($2.50) It might be considered a little dry to some but the delicious tamarind sauce sure makes up for it! Kadi with rice ($6.95) You can really taste all the different spices in this dish but I prefer choley as a vegetarian option. Butter chicken and rice ($7.50) Not the best butter chicken (I’ve had the best in Canberra!) but still a great steal at $7.50. 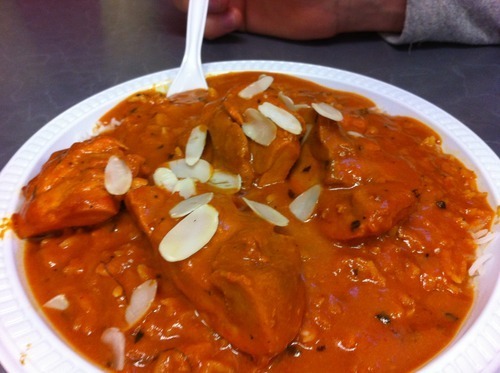 Choley Bhature (2 puffed bread with chick pea curry) $6.95 served 11:30am – 3:00pm. I have eaten a lot of different breads in my time- naan, roti, paratha, chapati but never have I seen “puffed bread”, these babies come out looking like footballs eventually deflating down to a flat bread, it can be a little oily but it tastes so good! The curry is also really good, all the chilli component is more in the condiments under the bread. It’s not called a sweets centre for nothing. Usually at an Indian restaurant you would see gulab jamun or your typical vanilla ice-cream with some topping but never did I imagine that there are such a variety in Indian desserts. A lot of them are very sweet, are either made from milk products or cheese and from what my friend tells me about the laborious process of making these sweets, it is much easier to buy them! I haven’t tried everything, but I am a big fan of burfi– not too sweet but I still take little bites. Jalebi– bright orange and fried dripping with sticky syrup and it is very sweet, I usually take a bite every few hours so I don’t come off my sugar high. Rasmalai– a mildy sweet cheese dessert in a very aromatic milky sauce and who doesn’t love a gulab jamun! Burfi– almond and cashew and chocolate oh my! And of course they have the famous gulab jamun, beautifully warmed too. I find the staff very friendly and patient as I stare up at the lit sign for a long time trying to decide what I want. To me it seems very authentic to see all these options you wouldn’t usually get in an Indian restaurant in terms of curries and desserts. They have a very casual dining area but when you’re here for a quick cheap lunch it is decent enough. 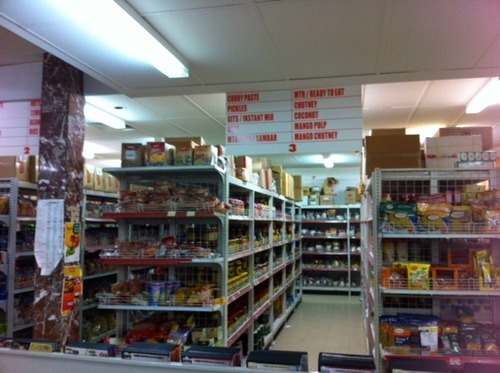 They stock so many spices, oils, rice and religious items, you are bound to find what you’re looking for at Bharat International, so while you are waiting for your food you can conveniently go shopping.